The Grassmarket Mission (Undenominational) was founded by James Fairbairn in 1886. 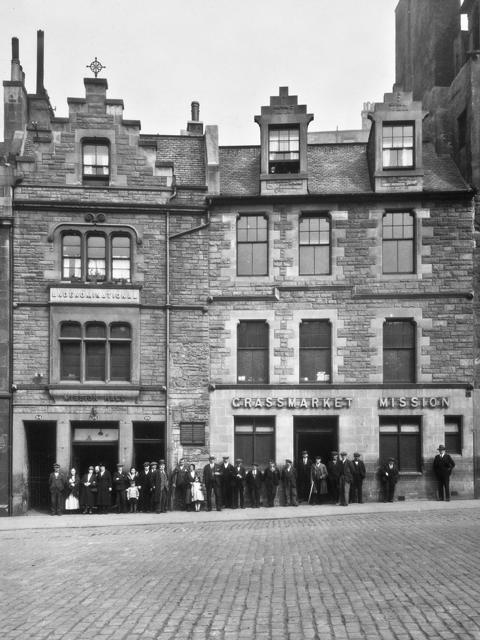 With the financial support of Mrs Jane Buchanan, he purchased the site and commissioned James Lessels to build, in 1890, the Mission Hall at 94 Grassmarket. That same year the Mission was registered by a Disposition and Deed of Trust as a charitable Trust with Fairbairn as one of the eight Trustees and Superintendent to the Mission. In the late 19th century, the Grassmarket was one of the slum areas of Edinburgh, along with neighbouring Cowgate. There were lodgings for those that could afford the meagre rents but the conditions were quite foul, with single rooms sleeping sometimes as many as eight people. 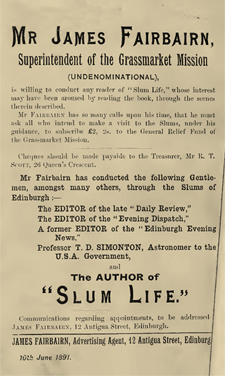 A contemporary account from "Slum Life in Edinburgh", published by James Thin in 1891, describes the squalor and deprivation endured by the hundreds of people in the poor quarters of the town. Many of these folk had turned to drink, spending what little they had to buy their way out of their senses - a condition which neither improved their prospects nor their health - but it was to the families, the children who had nothing, whose parents could afford them nothing and to the homeless that the Mission brought support. 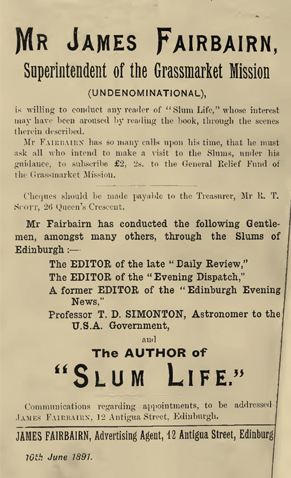 The Mission provided food and clothing as well as fellowship through the meetings and services held there and Fairbairn would organise talks, given by some of Edinburgh's most prominent citizens, that would attract donations to the work of the Mission, testament perhaps to his skill as an advertising agent. In 1930, the Mission purchased the building next door (at 96 Grassmarket) and constructed a new Mission Hall with an up-to-date kitchen, a clothing department and flats upstairs, which was officially opened in November that year - no mean feat in the depression era. The extra space meant that the Mission was able to expand the services that it was providing. Under the stewardship of Alexander Barrie, who was appointed Superintendent in 1916, the Mission was built up "into an organisation unimagined by his predecessors" to the extent that the Mission became known colloquially as "the Barries". To this day there are people who still remember "Barrie's trips". At one time up to 1500 children are said to have assembled in the Grassmarket, accompanied by 200 adult volunteers, to take the tram out to Gorgie terminus for a picnic in a field at Stenhouse Mills. In 1933 the Mission purchased a large house in Aberlady called the Poplars where the people of the Grassmarket could go "for a fortnight's rest, recreation and good example." These were, it seems, golden times for the work of the Mission though the plight of the poor in the Grassmarket remained. After the second world war, gradually, many of the missions and other charitable organisations closed their doors. With the advent of the welfare state, the worst excesses of deprivation had been removed, more and more 'professional' services were being provided by the government and local authorities, and the numbers of people living in the Grassmarket was falling. Families had been moved out to the council estates being built around the city suburbs, and improvements made to the built environment meaning that the Mission ministered to dwindling numbers. As it reached its centenary in 1986 the worsening financial situation at the Mission was never far from the minds of its Trustees. As they were underused and increasingly expensive to maintain, in 1989 the decision was made to sell the Mission Halls. The Grassmarket Mission continued to fulfil the purposes of its Deed of Trust through the encouragement and financial support of students of New College who were offered the use of Greyfriars Kirkhouse by the church as a base for Christian outreach and their work with the homeless. Meanwhile, in Aberlady, the situation at Poplars came to a head. 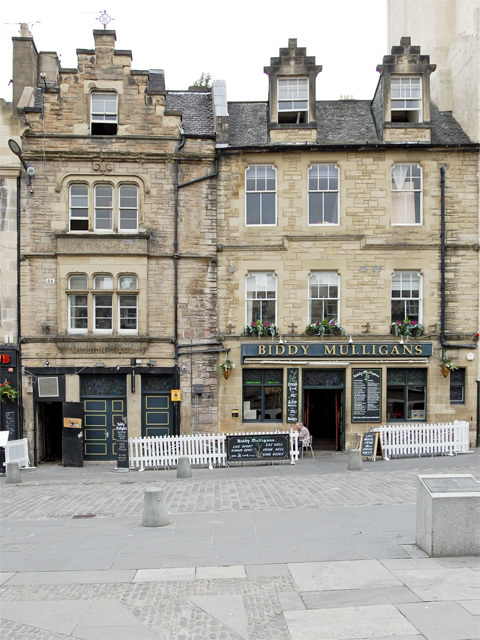 Not for many years had it fulfilled its role as a holiday home for Grassmarket residents. Essentially being used as a care home for the elderly, it had been running into difficulties financially, but with increased costs to comply with new legislation, staffing and upkeep of the building, in 2000 the Trustees decided to close the home and sell the buildings. The Mission now threw its support into the work of the New College students in developing the services being provided in the Greyfriars Kirkhouse and its community outreach programme, the Community Project, which included cookery classes, the GRoW project (creating quality products from recycled wood), CLOOT (Textile Social Enterprise) and the herb garden alongside its canteen provision - all provided in line with the Mission's aims. Agreement was reached with Greyfriars on the future of the Community Project and future development of the Kirkhouse. Joining with a housing association and with funding in place, plans were drawn up for the acquisition from the City Council of the neighbouring land, demolition of the existing buildings, including the Kirkhouse and the construction of a new 'landmark' building for the service of the community. Unfortunately as the global economic crisis took hold, the housing element had to be withdrawn from the scheme and a revised build, which saw the retention of the existing Kirkhouse, drawn up. The Grassmarket Mission and Greyfriars meanwhile agreed the way forward for the Community Project and in July 2010 the Grassmarket Community Project was incorporated. The Mission agreed to fund their work which now included the employment of a full-time fieldworker and assistant, a cookery co-ordinator and a caretaker. The charity is managed by a body of three trustees from the Mission, three from Greyfriars and three appointed independently. Today the Mission continues as an independent body, its future assured by its commitment to a project that combines the social concern of Greyfriars Kirk for its parish with that of James Fairbairn and the original Trustees who founded the Grassmarket Mission in 1886 for the relief of those who were in need. Work on the foundations, not only of the new Kirkhouse extension but also for the role of the Grassmarket Mission in the 21st century are well under way. A fuller account of the history of the Grassmarket Mission can be found in Alan Harding's book "The History of the Grassmarket Mission" which itself draws heavily on an earlier booklet "The Arches of the Years" published in 1961 which chronicles the first 75 years of the Mission (1886-1961).